We’ve discussed my sincere appreciation for lemons previously on this blog, and now I must take a moment to acknowledge poppy seeds. As a gal with Eastern European roots, I feel that poppy seeds are the seeds of my people. Slovaks and Hungarians are crazy about poppy seeds. We grind them into dust and cook them with sugar and water to slather inside dough for poppy seed rolls. We put them on breads and in muffins. My dear friend Tara (to whom I would swear I am related, perhaps as a distant fourth-cousin) always offers a poppy seed cake as a condolence at wakes, as is her family tradition. The person who wrote the recipe below claimed that it yielded 12 muffins when baked in a standard muffin tin. I’m not sure in which universe a recipe with three cups of flour only yields 12 muffins, but hey, I’m not going to judge. I tweaked the recipe slightly and added more lemon zest for extra flavor, and when all was said and done, I had 27 muffins. A note about poppy seeds: they can turn rancid when not stored properly or used in a timely manner, so they must be frozen or kept in the refrigerator. I keep my seeds in the fridge for up to six months; they should remain blue-black in color and retain their poppy seed smell when fresh. If they look or smell suspicious, throw them out. Whisk together flour, baking powder, baking soda, salt, and poppy seeds; set aside. Add lemon zest, beating until combined. Add the flour mixture and yogurt in thirds, alternatively, beating until just combined – take care to not over-mix your batter. Using a 2-inch cookie scoop or two tablespoons, drop batter into lined muffin tins, distributing batter evenly. Refrigerate any extra dough while the first two batches bake. Cool for two minutes in tins, then remove to a wire rack. Prepare lemon glaze; place powdered sugar in a medium bowl and add lemon juice, one tablespoon at a time, until you achieve a very, very drizzly consistency; I used about 3 ½ tablespoons of juice. 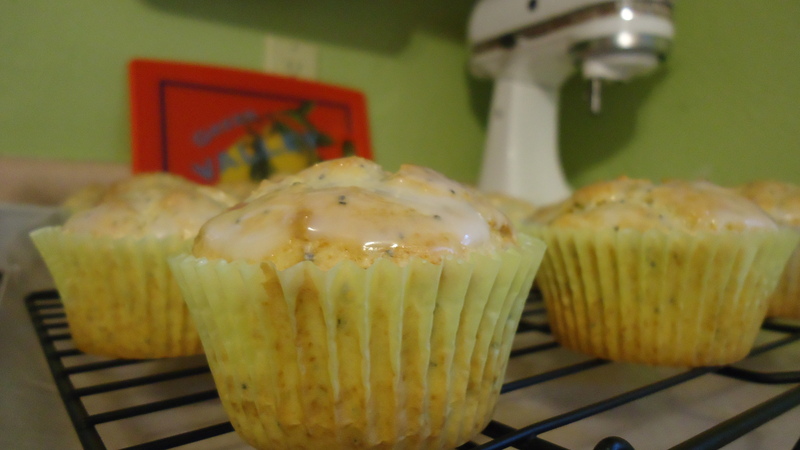 While muffins are still warm, brush the tops with the lemon glaze. Muffins can be glazed a second time if you wish.